New Pittsburgh Penguins' head coach, Mike Johnston, told the media that he wants to "Lessen the load" for team captain Sidney Crosby. Johnston told Tribune-Review reporter Jason Mackey "Do we have to lessen the load? Yes. We have to ensure that other players on our team take some of the responsibility off his shoulders — both in leadership and also in performance. He is a captain, and he is a leader, but it doesn't all rest on Sid.” Crosby, who played 80 games during the regular season, also played in 13 playoff games, as well as five games for Team Canada in the 2014 Winter Olympics. All the while carrying the Penguins to the best record in the Eastern Conference, while winning the scoring title, as well as the Hart Trophy for the league's MVP. By the end of the season rolled around, Crosby certainly looked and played like he was fatigued (As well as injured) by the time the end of the season came around. Keep in mind that Crosby played in more games last season than he did the two years before that combined. On top of that, Crosby led all NHL forwards in average time of ice, and was used in a more defensive role, and still led the league in scoring in a landslide. The Pens are a team that is absolutely dependent on Crosby and Evgeni Malkin, because of how good those players are, but also because of the salary cap and how the team is built. Last season, the Penguins finally saw the salary cap come back to bite them, as injuries and a loss of true quality depth plagued the team, until they finally met their demise in the second round of the playoffs. To say the Pens' bottom-six was bad last year is an understatement. When you go through an entire season with guys like Joe Vitale, Craig Adams,Tanner Glass, Chuck Kobasew, and Taylor Pyatt playing on your bottom-six, you have zero depth. Hence why Crosby led all forwards in the NHL in average time-of-ice. The five forwards I named combined for 16 total goals, and were all among the league's worst possession players. It also didn't help that both Evgeni Malkin and James Neal, missed 20+ games each last year. Pascal Dupuis, Crosby's right-wing also missed 43 games due to a knee-injury. Hence the reason why the Penguins played Crosby so much every single night. The Pens will get Dupuis back, as well as a new supporting bottom-six made up of Marcel Goc, Blake Comeau, Nick Spaling, and Steve Downie. New General manager, Jim Rutherford, has done a pretty damn good job of acquiring more quality depth to this roster. On paper, the bottom-six is already drastically improved. Third-line center Brandon Sutter, who just signed two-year extension worth $3.3 million per-year is the biggest x-factor. Sutter had a mediocre 2013-2014, tallying just 26 points in 80 games, but came on big-time in the playoffs, scoring five goals with seven assists. Sutter got his new contract and now needs to step up and be a more consistent and better overall player. If Sutter, can play at a high level on a more consistent basis, and if he can do this all the while playing against tougher competition. This will allow coach Johnston and the Penguins to get better match-ups for Crosby as well as not relying on him as much. One thing that can help out the depth even more would be either Beau Bennett or rookie Kasperi Kapanen emerging as a legit top-six forward. If one of those two truly pan out this year, that could help send a guy like Dupuis to the third line, creating a positive trickle-down effect for the entire lineup. Both Bennett and Kapanen both have the ability to make this happen, but Kapanen is very young and very raw, and Bennett can't seem to stay healthy. I can still see coach Johnston and the Penguins giving both of these youngsters every chance to make this ideal situation happen. This all sounds great in theory, but Crosby will be among the league leaders in ice time, and he should be. 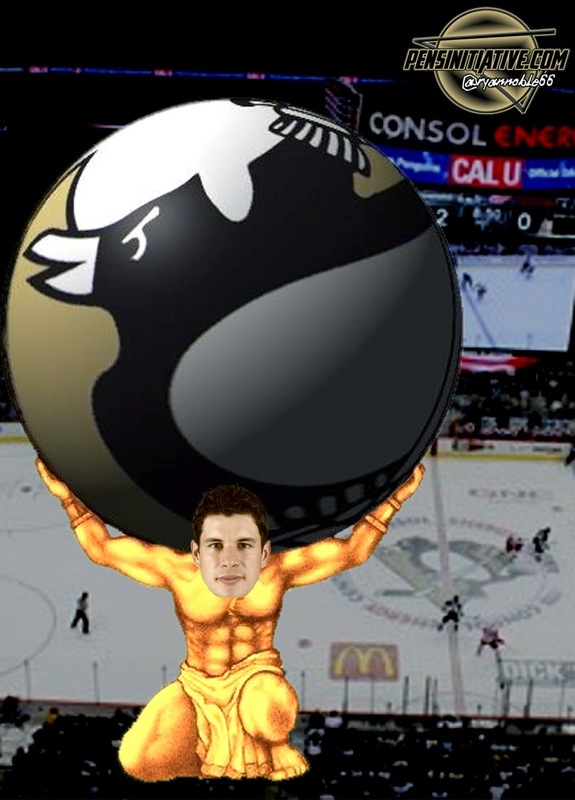 Crosby is a physical specimen and is the best player in the league. However, last year the Penguins were at a huge disadvantage when their third and fourth lines were on the ice. The replacements that they have put together for those spots this year are drastic improvements, thus taking a much needed "Load" off of Crosby and Malkin immensely. It will also be interesting to see how Johnston deploys Crosby this upcoming season. Johnston might be the coach that will use Crosby on the penalty-kill, for example, but giving him less defensive zone-starts during even-strength play. A better bottom-six, Sutter continuing to produce more, and more secondary scoring are the only true ways for the Pens to actually "Lesson the load" for Crosby. By doing all of that, the Penguins are already will be much better-and-tougher team to play against in 2014-2015.